Having reviewed the first two headsets in Kingston’s HyperX Cloud line, the feature that resonates with me most about the new Cloud Revolver is the steel suspension frame. Maybe reverberates is a better word. The original HyperX Cloud gaming headset from Kingston was a great pair of headphones with a so-so microphone. The Cloud II added a noise canceling microphone and simulated 7.1 surround sound via USB, rendering itself pretty much perfect for the price. The HyperX Cloud Revolver isn’t so much a continuation of the Cloud line as it is a new entry in the family. The original Cloud was followed by the USB-enhanced Cloud II. The Cloud Revolver is a nice base model without a USB interface, meant to connect to a console, PC or mobile device to deliver what’s already there as best as it possibly can. It uses its 50mm driver and increased frequency response to present a broader sound stage for more accurate positional audio with a greater sense of depth. The Cloud Revolver performs exactly as advertised as far as audio is concerned. Distant gunshots in The Division sound as if they’d traveled a long way to reach my ear. Rain effects in Final Fantasy XIV sounded more like being in the rain and less like being in an area temporarily assigned a sound effect. The highs are crisp and clear, even at max volume. For awhile there I was worried the headset was muddling bass a bit, but then I remembered that it’s working off my own PC sound settings and went into my equalizer and adjusted it to something a bit less stupid. The whole experience was much nicer on my Vita, where I didn’t have sound tweaking settings to screw up. In fact the only real flaw I found in the sound isn’t so much about sound as it is the headset’s design. Rather than the single leatherette wrapped band used in other entries in the HyperX Cloud line, the Cloud Revolver features a self-adjusting bacnd and a steel suspension band. The flexible metal band connects to the side of each ear cup. It’s a blessing. Also a curse. On one hand I found the headset immensely comfortable. I spent hour after hour with it perched atop my skull, and between the mildly floaty feel of the suspension band and the leather covered memory foam ear cups I never felt uncomfortable. On the other hand, every vibration of that metal band winds up right in my ear. If someone flicks it the metal band makes a sound like a tuning fork. Putting on the headset after a few hours of rest results in a short period of settling that reminds me somewhat of an old-style screen door opening. Ultimately the comfort and overall sound quality triumph over the occasional twang. Just don’t mention it to your obnoxious friends. And while we aren’t doing things, don’t record a podcast using the Cloud Revolver’s removable mic. I got no complaints chatting over PSN or within Second Life, but my personal recordings were brimming with sound and voice pop. One day someone will glue a massive professional microphone to a pair of headphones and I will never take them off. Until then I’ll stick to dedicated hardware for my sound recording needs and save the Cloud Revolver for casual conversation. 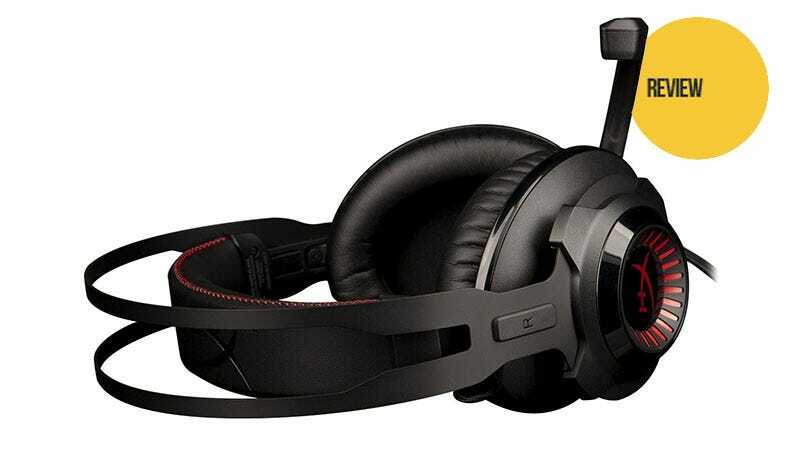 After spending the better part of a month with the HyperX Cloud Revolver headset I’m still not feeling quite as sure about it as other entries in Kingston’s HyperX series. I like most of what it does. I’m just having trouble wrapping my head around the metal wrapped around my head. The HyperX Cloud Revolver is now available for preorder, with a suggested price of $119.99 and an expected release in early May. Update April 10, 2:30 PM: Clarified the relationship between the Cloud, Cloud II and Cloud Revolver in the third paragraph.